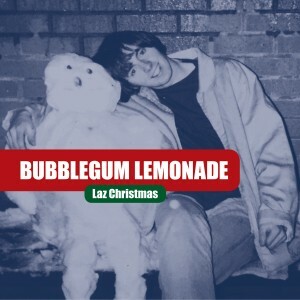 Scottish favorites Bubblegum Lemonade celebrate their tenth release in ten years with a brilliant six-track holiday EP entitled ‘Laz Christmas’. Lead track ‘Number One for Christmas’ is a surefire Christmas earworm with a big pop chorus and plenty of sleigh bells. In an alternate universe it would be battling for number one on the pop charts, but in our world it’s a safe bet to kick off your holiday playlist. ‘No Room At The Inn’ is the story of a modern day Mary and Joseph that ends with a wonderful vocal / fuzz guitar climax, and ‘Sunflower In The Snow’ is a song about the recent spate of weird weather that blends Beach Boys effervescence with the darkness of the Velvet Underground. ‘At Christmas Time’ is guitars jangling and festive shambling for the Postcard Records crowd, while ‘New Year Or New York’ sets the tale of a war veteran thinking back about a lost opportunity to an elegantly presented keyboard motif. The EP ends with an indiepop take on the traditional Christmas song ‘Silent Night’ with perfectly shimmering guitars, more sleigh bells, tambourine, and dulcet backing vocals by Sandra of Strawberry Whiplash. Limited to 1000 copies in a festive eco-wallet, ‘Laz Christmas’ is a new holiday classic!